This is a wonderful new CD of 15 tunes by 20 talented young musicians and vocalists. They are also joined by quite a few Austin, Texas musical legends as guests. It was produced by Vance Cone and Anna Macias. Anna is also heard on harmony vocals and as one of the many wonderful fiddle players. Among the legendary guests on the album Ray Benson is the lead vocalist on Bill Haley's Crazy Man Crazy, Floyd Domino plays piano on six of the cuts, Eddie Rivers plays steel guitar on five of the cuts and Elizabeth McQueen is the harmony vocalist on two cuts. The album opens with three pop music standards, Irving Berlin's Blue Skies, Jimmy McHugh and Dorothy Fields' Exactly Like You and Peggy Lee and Dave Barbour's It's a Good Day. There are also so many recreations from the Bob Wills songbook which include Cindy Walker's I Hear You Talkin' and the 1930s memories, Ida Red and Yearning. Also borrowed from Wills and the following decade are My Confession, Fred Rose's Roly Poly and Bob Wills and Tommy Duncan's Take Me Back to Tulsa. There is also Buck Owens and the Buckaroos' Cajun Fiddle, I Wonder from Asleep at the Wheel and from both Roy Rogers and the Crosby/Andrews Sisters team is borrowed Along the Navajo Trail. There is also the mariachi Los Laureles and the album closes and changes moods completely with the Stevie Wonder memory Sir Duke. 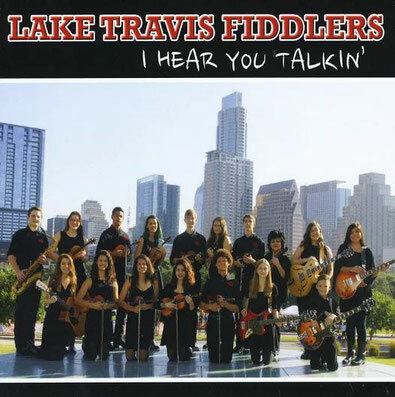 The CD can be purchased from CD Baby or at http://laketravisorchestra.org/shop-lt-fiddler-store/ or by mail by check or money order for $17. from LTOP Booster Club, 12400 Highway 71 W., Ste. 350-363, Austin, TX 78738. Checks should be made out to LTOP.